Cape Town, 1952. Amina (Sheth) is a young Indian woman who owns and runs the Location Cafe, a haven for both the local Indian community and the blacks. Miriam (Ray) is an Indian housewife and mother of three who visits the cafe and finds herself fascinated by Amina’s seemingly carefree, yet proud attitude. Her husband, Omar (Dabas), opens a general store on the outskirts of the city, and for a while, things progress as expected. Omar’s sister, though, puts them in danger when she comes to visit from Paris with her white husband. The police discover their presence, and Omar’s sister, Rehmat (Sen), is only saved from arrest by Amina’s hiding her. This helps to build Amina and Miriam’s friendship, something that is aided by Omar’s decision to hire Amina to create a vegetable garden behind the store. The two women spend more and more time together, and their friendship deepens until each begins to acknowledge the attraction they have for each other. But how can their love flourish when they have to contend with the social, sexual, cultural and political milieu they’re a part of? A romantic drama set in a time and place that would have heavily condemned the sexual love of two women for each other, The World Unseen is a carefully paced, judiciously mounted movie that isn’t too interested in putting its central characters in too much jeopardy, while it explores themes related to the racism and homophobia of the period. Adapted from writer-director Sarif’s own novel, her tale of fledgling love amidst the trials and tribulations of apartheid South Africa is a low-key affair, telling its story simply and with due care and attention to the characters of Amina and Miriam. Thanks to Sarif’s script and the performances of Ray and Sheth, both women are sharply drawn, and their thoughts and feelings expertly expressed through covert looks, cautious body language, and coded language. The slow reveal of their feelings for each other is hidden behind a veil of subterfuge, and Sarif shows the mounting tension between Amina’s longing for Miriam and Miriam’s hesitancy over what it will mean to her marriage and her children, in such a way that the sincerity of their emotions is never in doubt. With the movie’s central relationship locked in, Sarif is free to build around it, adding sub-plots and minor incidents to help flesh out the running time. Sadly, not all of these sub-plots are as successful as they could have been, and though they don’t do anything to hurt the pace of the movie – Sarif’s measured direction ensures everything proceeds at an even pace – there are too many that feel as if they’ve been lifted from a soap opera. Amina’s silent partner in the cafe, Jacob (Dennis), has a predictably short relationship with a white postmistress (Fox), Omar has a secret that Miriam has no choice but to tolerate (at first), and Amina’s grandmother tries to push her into an arranged marriage. Most of these elements end as quietly as they began, and lack any appreciable impact, but thanks to the engaging quality of the material as a whole, the movie doesn’t suffer as dramatically as it might have done. The rest of the performances are adequate (though Moss’s permanently aggressive policeman is particularly one-note), and the visual style is consistently muted in terms of colour and light, something that robs it of any further appeal, but overall this is a quietly persuasive movie that does very well by its central characters. 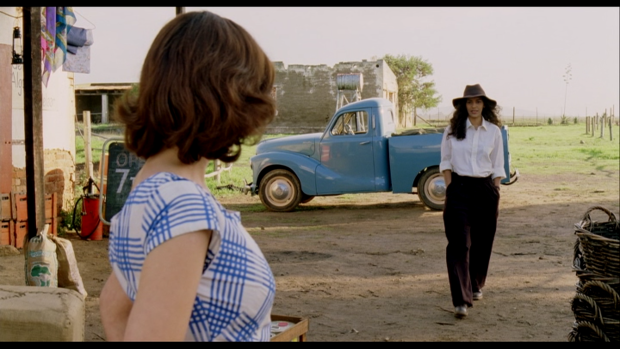 Rating: 7/10 – with its well conceived romance, and passive recreation of the time period it’s set in, The World Unseen is exemplary when focusing on its central characters’ hopes and dreams, but less so when the focus switches elsewhere; Sarif’s first outing as a writer and a director shows promise, and there’s a clear message about female empowerment, but in the end, there’s too much that feels perfunctory instead of important.